We take our breakfast seriously at the Kimmell House Inn! 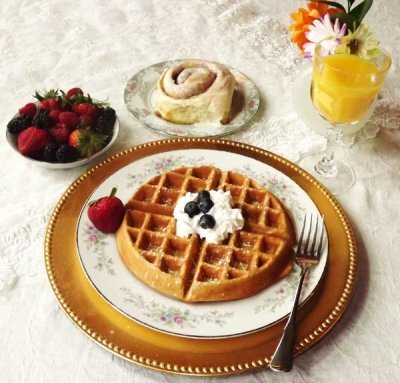 When staying with us at the Kimmell House Inn, it is our pleasure to serve you the most important meal of the day. We consider your breakfast an opportunity to share with you a creative dining experience. Enjoy a delicious, homemade, three-course hearty breakfast. Start out with refreshing juices and fresh seasonal fruit bowls. Some of our guest’s favorite and most requested hot dishes are Garden Veggie Quiche, our simple hash browns(don’t mess with a tried-and-true classic! ), Honey Almond French Toast, and Cinnamon Apple Pancakes. We serve an array of original pastries-the selection is always different! Giant warm cinnamon rolls with cream cheese frosting, apricot white chocolate scones with clotted cream or blueberry banana bread, just to name a few. Breakfast just isn’t right without coffee-and we serve the best! We grind our beans right before we brew-so you know the flavor is deliciously fresh. If tea is more your style, you are sure to find one to your liking among our selection of Republic Teas. We have more than 50 to choose from! We also have a full service espresso bar to satisfy those who love something fancy with their breakfast. Our goal is warm hospitality and true comfort that epitomizes today’s bed and breakfast experience. Special dietary needs can be accommodated. Let us know when making your reservation and we’ll be happy to adjust our menu. Please feel free to invite your family and friends to join you for breakfast. Menu pricing is available. 24 hr notice is needed.